How to Make a Rosary? As you begin taking the first steps to fulfill your desire of becoming a Rosary Maker for Our Lady, you will need to invest in a few tools and supplies. Some are essential, while others are up to you. 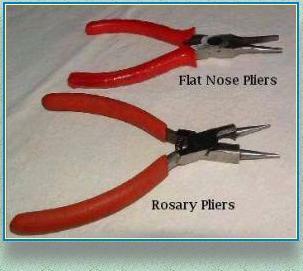 You will need to buy 2 pair of pliers; at least one must be "Rosary Pliers." 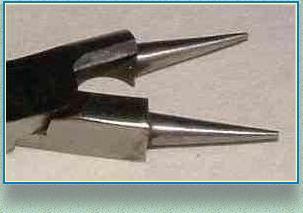 Rosary pliers differ from other needle nose pliers in that they have a graduated tip, small enough at the end to make the proper size curve for the eye pins, and also include a wire cutting feature which you will use to cut your lengths of chain needed to make a chain rosary. Most people are comfortable using 2 pair of rosary pliers while they work. One pair for their work hand, right or left, as the case may be, for working with the eye pins, handling jump rings and cutting chain, and one flat nose pliers for your other hand for a good secure grip on small parts. 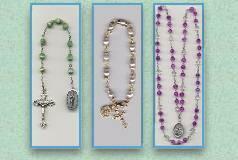 If you plan to make Rosaries from Cord and Beads, you'll need to invest in a few Cord Rosary Tools. 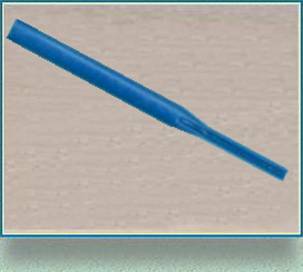 The tip is grooved to form a "tunnel" through which Cord is threaded to form the special "barrel knots" used in making Cord Rosaries. If you plan to make many rosaries for Gifts, for the Missions, or for a resale business, you will need a handy place to store your beads. 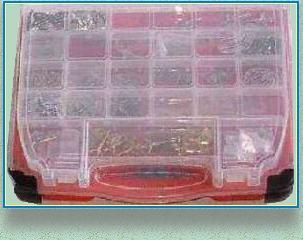 Fishing tackle boxes work very well, as well as craft boxes. Any inexpensive box or storage container with a tight fitting lid works just fine. 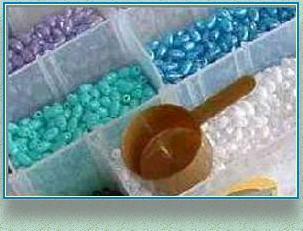 Beads may also simply be stored in zipped-top type plastic bags. You will want to have another box in which to store your "Findings." These are all of the other parts of your rosary beside the beads: the crucifix, the center, the jump rings, the eye pins and the chain. One with a see through lid like this one is a favorite as it allows you to see and store items on two levels; the top lid lifts to deep sectioned pockets of storage below. As your inventory grows, you will need a secure place to keep your metal parts where they will not get scratched, and will be kept dust and tarnish free. While this is not an essential, we highly recommend having your own "work box." We've made our custom workbox out of a standard size wooden tray we picked up at the local crafts store. Lining with felt and adding wooden dowels separates the work space into areas to hold your eye pins, beads, and other parts. 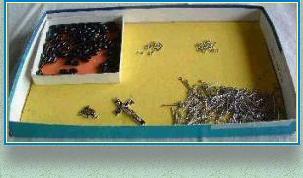 A work box will help your parts all in one place while you are working on a rosary. 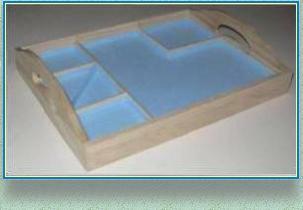 Or you can make your own work tray by lining the lid of a simple shoe box with felt or craft foam. Light color lining allows a good contrast to be able to see the tiny parts you'll be working with more easily. The lining also adds a certain amount of cushion, making it easy to pick up those small parts with your pliers. It will also help keep your parts from rolling around. We've added another small cardboard box to hold the beads. The last thing you want is to have beads rolling all around, or spilling on the floor. 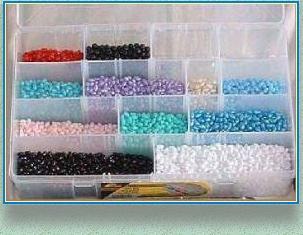 Use a small measuring cup or other cup to scoop your beads from the Bead Box into your Work Box. A coffee scoop or measuring spoon works perfectly! Of course you can always invest in "professional" beading products. Just be aware they can be quite expensive. With our work for PrayTheRosary Apostolate, we've created a work and storage area to keep track of our inventory, our rosary orders, and the Mission work we do. You'll want to do the same if you are going to be making rosaries in large quantity for the Missions, or if you will be selling your rosaries. 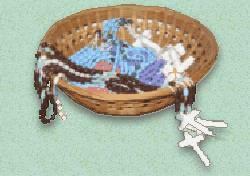 A little creativity will result in the perfect storage system that fits the space on hand, your budget, and the work you will be doing as a rosary maker.